If you seek an alternative to canned crab meat -- and you don't want to spend hours prying the meat from crab shells -- you might be tempted to turn to imitation crab meat for your recipes. Made from white fish, imitation crab meat goes through processing so that it approximates the taste of real crab. While it has some nutritional advantages, imitation crab meat also contains sweeteners and sodium, so you should consume it in moderation. Imitation crab is relatively low in calories -- even a generous 6-ounce portion contains just 162 calories, or 8 percent of your daily intake in a 2,000-calorie diet. Almost two-thirds of these calories come from the crab's carbohydrate content, and each serving contains 25.5 grams of total carbohydrates, including 0.8 of a gram of dietary fiber. Consuming 6 ounces of imitation crab also boosts your protein intake by 13 grams. Your cells use protein to repair damaged tissues, synthesize hormones important for your health and make enzymes needed for cellular metabolism. Imitation crab is low in fat, at less than a gram per serving. Eating imitation crab boosts your vitamin intake, especially your vitamin B-6 and B-12 consumption. Both vitamins play a role in the health of your nervous system, because they help you make neurotransmitters -- chemicals that facilitate nerve cell communication. Both vitamins also help support red blood cell production, a process essential for oxygen transport. A 6-ounce portion of imitation crab offers 0.22 milligram of vitamin B-6 -- 17 percent of the recommended daily intake -- as well as 0.97 of a microgram of vitamin B-12, or 40 percent of your daily B-12 intake recommendation. Imitation crab also helps you consume more selenium and phosphorus, two minerals essential for good health. Every cell in your body needs phosphorus, because it's required for DNA synthesis, controls enzyme activity and plays a role in cell communication. Selenium promotes cardiovascular health by supporting blood vessel function, regulates your immune system and activates proteins linked to cancer prevention. 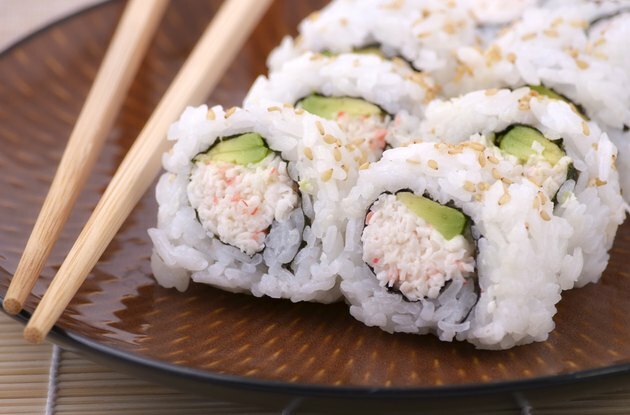 A serving of imitation crab boasts 479 milligrams of phosphorus, or 68 percent of the recommended daily intake, as well as 38 micrograms of selenium, or 69 percent of your daily recommended selenium intake. Imitation crab has two major nutritional drawbacks -- its sugar and salt content. Each serving of imitation crab contains 10.6 grams of sugar. The sugar added to the crab improves its flavor, but also increases your calorie intake. You should limit your overall sugar intake to avoid obesity and cardiovascular disease, according to the American Heart Association. A 6-ounce portion of imitation crab also contains 899 milligrams of sodium, which is 39 percent of the 2,300-milligram daily limit recommended in the Dietary Guidelines for Americans 2010, as reported by Colorado State University Extension. And that amount of sodium is 60 percent of the 1,500-milligram limit recommended for African-Americans, people who have high blood pressure, or for those over 51 years of age. A diet high in sodium increases the workload on your kidneys, and also contributes to a range of diseases, from osteoporosis to stomach cancer. Is Pepperoni Good for You?